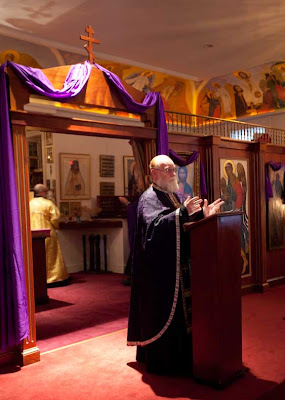 I've blogged about this before, but it always strikes me when I visit another Orthodox parish that in all of the differences between Orthodox jurisdictions, there is an utter sameness that predominates. Yesterday evening, I attended St. John the Wonderworker, an OCA parish in Atlanta, for a Vespers service. As with this post detailing my visit to St. Paul Greek Orthodox Church, a Greek parish in Savannah, the differences were immediately apparent. The piety was somewhat "stronger" than in our home parish -- most of the ladies had their heads covered (several in our parish do this, but the majority at St. John wore a headcovering of some sort), almost everyone was very reverent when venerating icons, with the minimal level of piety displayed being a series of three metanias, and (a first for me!) there were no pews in the parish except a couple of benches around the perimeter of the nave. The tones were distinctly Russian (which is to say, more "western" sounding than I am used to). And yet, as with the Divine Liturgy at St. Paul, I was never lost. I never had to wonder what was going on in the service. I never had to guess what came next. The words to some of the hymnody and prayers were slightly different, more modern. But the essence of the hymns and prayers were the same. At some point after our conversion, I quit waiting for the other shoe to drop. I've seen scandals rock not only our archdiocese but the OCA as well since we came on board. I've seen criticism of various positions taken by various Church leaders. I've seen some of the ugly side of Orthodoxy (which is no different than the ugly side of any tradition, honestly). But the one thing I don't have to worry about in Orthodoxy is the rank liturgical wonkery that is present in other traditions. Maybe I'm still working off of too small a sample size, but I've visited a handful of Orthodox parishes separated by hundreds of miles and across three different jurisdictions at this point. It's all the same. It's all Orthodox. And rather than having to look for a parish that maintains the traditional forms and ancient faith, I expect any Orthodox parish I enter to do that. I expect it because that's what the Orthodox do, and that's who we are. Rather than being merely disappointed, I would be stunned if I found anything other than a solid, liturgical service at any Orthodox Church anywhere. The liturgical offices are the one constant in the Orthodox Christian Church. They have maintained our faith through oppression, martyrdom and tyranny. And they maintain my children today in a way low church Protestantism never could. The Church in its collective wisdom has held this same faith together in the same way for nearly 2000 years. It is a great comfort that our Church takes that responsibility very seriously. After some time it is easier to see the differences when they are there, and to understand the differing paradigms that lie behind these differences. Early on it's hard to notice since it's all so different. They include, saying the priestly prayers aloud, use of the doors and curtain, the cutting of litanies and other abbreviations, subdeacons intoning deacon's litanies, eucharistic preparation, whether Orthros or Vigil is served prior to Liturgy, combining other sacraments with the Liturgy, communing Non-Chalcedonians, resurrection of long defunct or little used liturgical practices, etc. None rise to the level of creativity and unilateralism one finds in the West, but there are differences that go beyond simply matters of taste and accident. Differences arise that much more due to regional variety. That is, visiting different churches in the South will likely reveal more commonality than were you to visit Orthodox churches of different jurisdictions in the Northeast, Midwest, West, Alaska, etc. Of course, the commonalities far outweigh the differences, but there are more differences (with deeper import) than is sometimes easily discernible in the early years after conversion. I can see how that would be. And yet, I'm comparing it to essentially liturgical freelancing, so I would still be stunned if the differences were as material as I am used to seeing (and mourning) outside the Church.